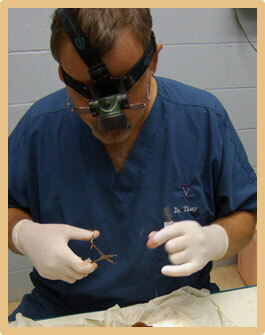 We understand that surgery is not an easy experience for you and your pet. At Tharp Animal Health Care Center we strive to ensure your pet’s surgical procedure is as comfortable and stress-free as possible. To that end, we also endeavor to provide our clients with a clear understanding of why a particular procedure is necessary, what the procedure entails, proper post-operative care, and convey any other information you may need to feel comfortable that you are making the right choice for your pet. Whether your pet requires a routine spay/neuter procedure or needs a more complicated orthopedic, soft-tissue, ophthalmic or emergency surgery, the veterinarians at Tharp Animal Health Care Center are well-equipped to handle your pet’s surgery needs. Before surgery, every patient undergoes a thorough physical exam. This helps identify any pre-existing medical conditions that might complicate surgery or affect your pet’s response to anesthesia. We also offer pre-anesthetic blood testing on each pet which allows us to get a better idea of your pet’s overall health, and allows us to tailor an anesthetic regimen that suits your pet’s needs. Staffed by highly trained veterinarians, we are proud of the quality of our surgical care and the wide range of surgical procedures we offer. What is a laser? A laser is a device that generates an intense beam of light that can cut, seal or vaporize tissue. For over 30 years, lasers have been successfully used on humans. This knowledge gained in human medicine is beneficial for your pets. Your pet’s health is as important to us as it is to you. Advances in veterinary medicine now allow us to offer laser surgery as an exciting new option for safer, more comfortable treatment. In many procedures, the laser can replace the scalpel and provide a better alternative to traditional surgery. Dr. Tharp saw the importance in moving forward with the latest technology and became certified in Advanced Laser Surgery through the Continued Education Certification Program at the Ohio State University College of Veterinary Medicine. Now Tharp Animal Health Care Center is able to offer laser surgery for a number of soft tissue procedures such as spays and neuters, mass removals and more. Tharp Animal Health Care Center – "Laser Surgery Center of Excellence"
"In recognition of your commitment to provide the highest quality medicine in the Veterinary profession, we are proud to recognize that you are among the Top 20 percent of Veterinary Clinics in the United States offering laser surgery to your clients and their pets. We at Cutting Edge thank you for your support and for your continued Commitment to Excellence within the field of Veterinary Medicine." 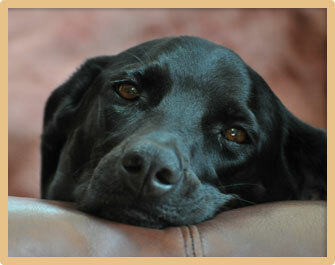 Less Pain – nerve endings are also sealed as it cuts resulting in less pain for your pet. Less Swelling – laser energy does not tear or bruise tissue because it is just an invisible beam of light touching your pet. 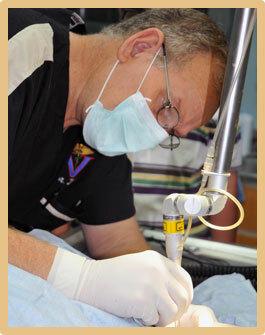 Laser surgery is commonly used in soft-tissue surgical procedures. 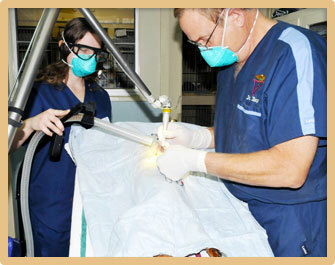 Your veterinarian will be able to tell you if your pet’s procedure can benefit from laser surgery. Anesthesia and cardiovascular monitoring are important integral aspects of every surgery we perform. For this reason, your pet has access to IV and gas anesthetic administration and cardiovascular monitoring equipment and protocols. Prior to anesthesia all pets are examined by a doctor and a pre-surgical blood screen is offered. Underlying diseases and conditions may complicate the use of anesthesia, and so these screenings are important for your pet. The results of these tests and your pet’s past anesthetic history, breed, preexisting conditions, and age are used to create an individualized anesthesia protocol for your pet. Your pet’s safety and comfort during anesthesia and surgery are our highest priority. We utilize advanced surgical monitoring instruments, including EKG, pulse oximetry monitors, blood pressure monitors and other instruments to ensure your pet’s vital signs remain stable during surgery. This system continuously monitors your pet's arterial oxygen level, blood pressure, heart rate, respiratory rate, and core body temperature. We also have the option to apply heat therapy to ensure a safe body temperature is maintained throughout longer procedures if necessary. During surgeries, a specially trained veterinary technician is on hand to assist with the procedure and closely monitor your pet. Tharp Animal Health Care Center also believes that identifying and relieving pain is essential to the recovery of your pet because your pet recovers from surgery more quickly when he or she is not in pain. Therefore, pain management is an important aspect of your pet’s surgical procedure with your pet receiving pain medication before and after surgery. We develop each pet’s pain management protocol on a case-by-case basis. At discharge, we highly recommend additional pain management medication to be taken home with your pet after providing a thorough explanation of its proper use and dosage.